Hello Everyone!! It's Lindsay from the DT here with you today, kicking off the first day of reveals during the July New Release! 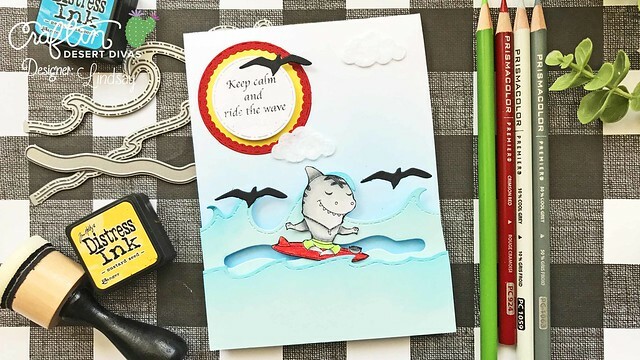 Today, the DT is highlighting a few new stamp sets, Jawsome & Ocean Friends, and one new die set, the Ocean Border Dies. 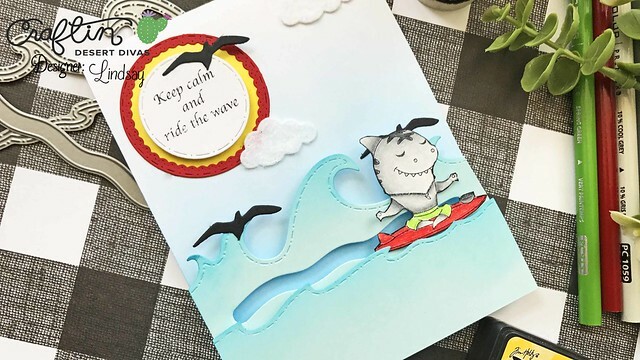 On my card today, I used the brand new Jawsome Stamp Set along with the Ocean Border Dies to create a fun and interactive slider card!! Be sure to watch the full video tutorial below and then head on over to the Facebook Release Event and check out all the amazing projects the DT has made!! The new Jawsome stamp set has some amazing and fun images. After stamping and coloring in the meditating shark with my Prismacolor Colored Pencils, I fussy cut him out. Then, using a black alcohol marker I went around the cut edges and gave it a more finished look. Quite a bit of die cutting went into this card. I used the brand new Ocean Border Dies to die cut a large wave border and also a small one. After adding a little Mermaid Lagoon Distress Ink to the edges I also die cut the slider element into the large wave border. Be sure to watch the video tutorial for all the details on how to put the slider element together! I popped up both wave border with fun foam and double sided adhesive onto an A2 top folding card base that had been sponged with a bit of Salty Ocean Distress Ink. I added the die cut sentiment onto a yellow sponged circle with a red die cut scalloped circle. Finally, I added a few die cut clouds and birds. For added texture I die cut the clouds from felt! If you haven't already, be sure to head over to the Facebook Release Event Page. Over on that page, you will get the first look at all the new goodies, access to freebies that are being given away, and entered into giveaways to win free CDD product!! If you are interested ina ny of the supplies I used on my card today, you will find them all linked below! Remember though, the new product links will not work until 7/10/17 at 12 PM EST. Happy Crafting!!! So cute! 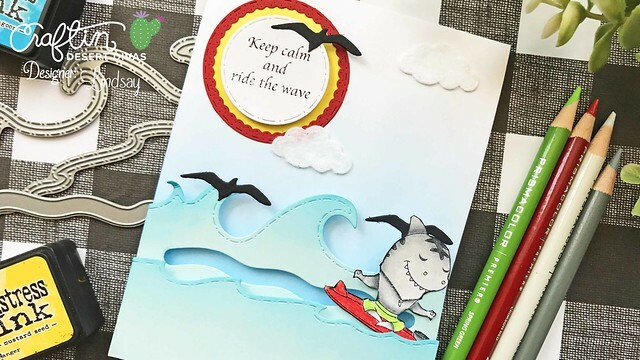 Love this Jawsome creation with your soft beautiful coloring! Fun slider card, Lindsay. Love the ocean wave die! This card is amazing and I'm loving the sneak peeks today! Thank you for the wonderful tutorial and your colouring is beautiful too! Adorable! I love the shark surfer! Love the waves! A must have!